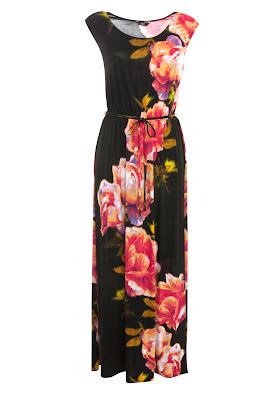 Adding a few inches to my last blog post about midi's and talking about a maxi dress today. I have a post scheduled for next week (have I mentioned I'm going on a kid-free wedding anniversary/significant birthday mini-break next Tuesday?!). 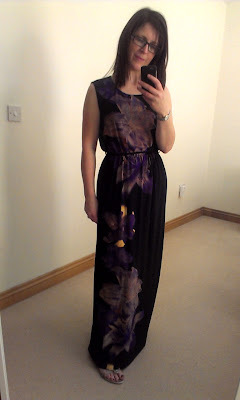 Anyway, this scheduled post will be all about my pick of the high-street maxi dresses. But then I found another fabulous one in Tesco while on a swimwear mission. Well, in actual fact, I was out on a milk-buying trip again. I am deadly serious...milk. If this third milk-related shopping spree doesn't have hubby booking a milk delivery, I'll be amazed. So en-route to the dairy department, I firstly spotted swimwear. Tummy control swimwear. GET. IN. MY. TROLLY. NOW. I have a long torso and my cleavage is high so I need a lot of material to get up and over the norks. That means swimsuits are out for me (wedgie city) and as the twin pregnancy has made bikini days a distant memory, it had to be a tankini - another awful fashion mix-up word. Up there with skort. I wanted black but they only had purple in my size and I'm leaving in 3 days so purple it had to be. On the plus side, it fits like a dream. Well done Tesco - £16 the lot. But then I spotted that there's £5 off a £25 clothes shop at the moment. Of course, I had to buy something else to avail of the discount. 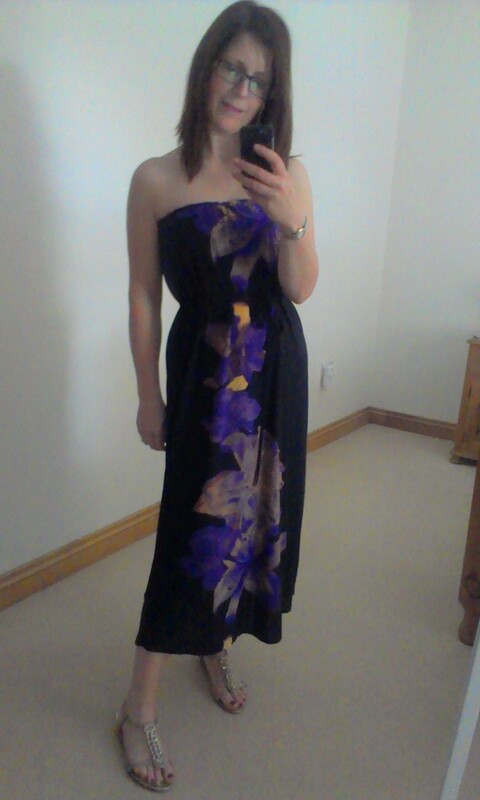 I had other reasons for choosing this dress beyond holiday plans and £5's off. You see, I actually wanted a maxi skirt - not a dress. But the stretchy jersey and wide neckline got me thinking that maybe I could wear this dress as both. That led to a few other ideas. Firstly, here it is on me as it's meant to be worn.. 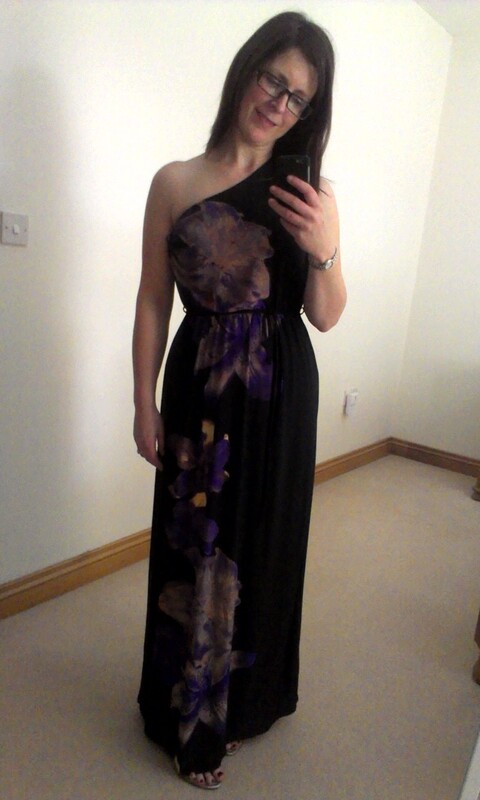 I wondered if it could work as a one shoulder dress - more suitable to a night out. Some tucking required but the material is light and stretchy enough to work well this way. Then I thought about strapless midi...with the top half of the dress tucked down and the belt around the waist. Perfect for the beach. and finally - the look I really wanted. The maxi skirt. My legs are going through the neckline of the dress. But it's wide enough to accommodate them. It's a steal - all those looks for £16. 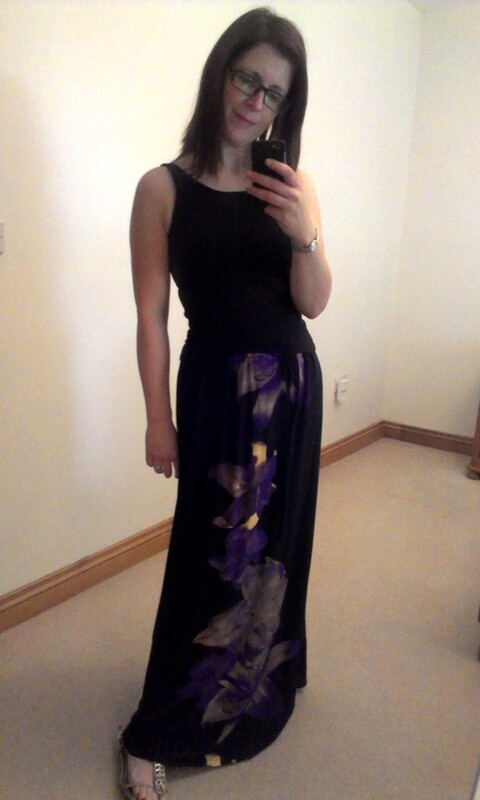 Again - well done Tesco, especially as this dress is designed and made in the UK. And well done for putting this en-route to the milk aisle. So I'm off for a busy weekend of list-making, cleaning & cooking to prepare the house for Aunty Sharon arriving to look after the kids. Oh and there's the small matter of packing, outfit planning, blog post writing & beauty treatments to get me mini-break ready. Have a super weekend whatever you're up to. I might have one more post before I head off but then again, I might not. But never worry, you have a week of my 5 Summer Essentials to keep you entertained in my absence and if that's not enough, you can follow me on Twitter & Instagram for holiday updates as they happen! Agree... the maxi dress and all it's looks wow! Must tell you, though... that paragraph in regard to the "tankini" might be the best thing I've read in ages. Hilarious and spot on. Tankini and skort? I mean really. Not to mention, the word "norks." Fantastic word! Love! Just came across your blog and following you now! "Up and over the norks" Hilarious - have never ever heard that expression. Am purloining that one immediatemoi! Love the two bottom ones on you - that shot of purply blue is just great on you. "Course at that price you could take both! Happy American Mums Day! Plus plus, OOh I've got so much to say today. I have long torso also have have to buy about four sizes up to get the length and avoid said wedgies. OMG check you out with what looks to be the most versatile maxi dress EVER! When you tucked in etc was is secure enough to wear out like that? Have a ball on your mini break and have fun!! What a great idea. I am sure your bikini days are not over. Love that maxi dress Avril - but very curious as to how you achieved the last look (maxi skirt)? How did you fix it do that the dress (skirt part) was not too long? Did you tuck the bodice in somehow...? !